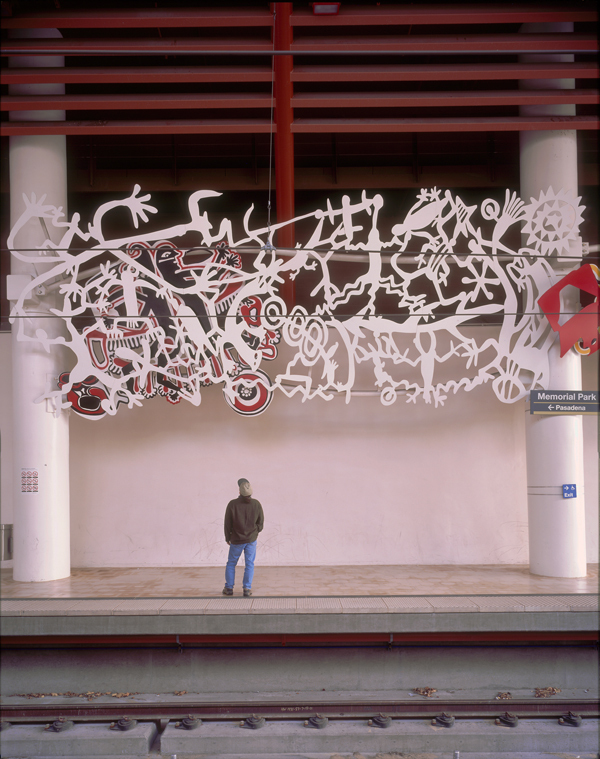 Located under the Holly Street Village Apartments and adjacent to Memorial Park, this station inspired John Valadez to honor the area’s earliest indigenous artists, whose ancient pictographs and carvings have been discovered in caves and on rock cliffs and natural outcroppings throughout Southern California. Cutout aluminum images of stylized figures and reptiles based on ancient tribal designs produced by Native Americans inhabiting the coastal and southwestern regions of California were created by Valadez. These images hang suspended between columns above the station platform in an undulating lyrical composition over 100 feet in length. Vibrantly painted in red, orange, white, black, and yellow, the interconnecting graphic elements cast shadows against the station wall, providing a striking contrast to the cavernous station and bringing a rhythmic pulse to the surroundings. JOHN VALADEZ received his Bachelor of Fine Arts from California State University, Long Beach. He was Artist in Residence at the Foundation d’Art de la Napoule in France in 1987. Other honors include: a California Community Foundation Getty Trust Fellowship; a Joan Mitchell Foundation grant; a General Services Administration Design Award for artwork at the Federal Building in El Paso, TX; and an Art in Public Places Award from the Architecture Foundation of Orange County for his project at the Federal Office Building and Courthouse in Santa Ana, CA. His work has been exhibited in museums and galleries throughout the US, Europe, and Mexico.